Power Rangers for your wall! It's a Mighty Morphin' fine art lithograph that doesn't actually morph. Limited edition of 993 pieces! Put a Power Ranger on your wall! The hit Mighty Morphin' Power Rangers television show can now be brought to life on your wall with this totally awesome, nostalgia-inducing Power Rangers The Red Ranger Fine Art Lithograph. 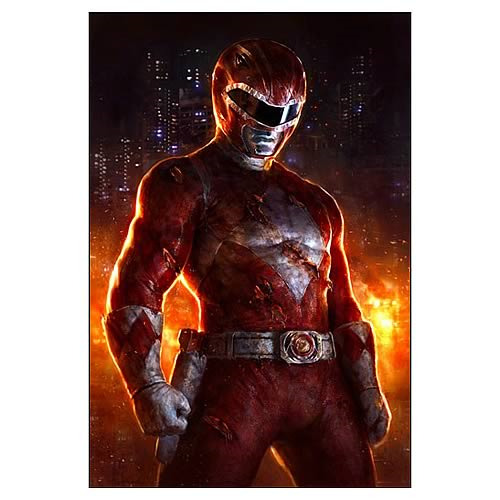 Featuring quite the awesome image of the Red Ranger surrounded by flames with a night-time cityscape in the background, this beautiful piece of art measures 24-inches tall x 16-inches wide. It's a limited edition of 993 pieces. Ages 14 and older.